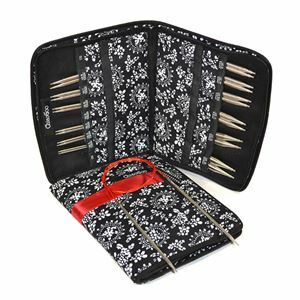 Chiaogoo TWIST Interchangeable Needle Sets are possibly one of the best sets of Stainless Steel circular needles you will find. Using the same cable technology used in the fixed circulars, these cables have a steel core and so they have no memory. Twist them and they'll always go back to their original straight shape. The needles are precise without being to "pointy" and have proved a hit with those knitters who have used them. Available in three sets: Small, Large and Complete, they come with a range of cables, connectors, stoppers and stitch markers, all wrapped up in a beautiful zipped case, that will leave you wondering how you ever got by without them.